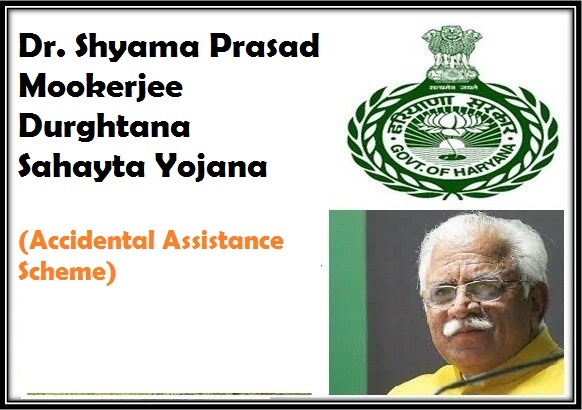 A new scheme termed as Dr. Shyama Prasad Mookerjee Durghatana Sahayta Yojana has been announced by the Haryana government for implementation in the state. Under the new scheme the state government has announced to offer with Rs one lakh for each of the beneficiary. Under the recommendations made by the state government the new scheme is focused on offering with premiums to the beneficiaries free of cost. As per the latest recommendations collected the state government has not yet decided to the exact dates for implementation of the scheme. The scheme will be implemented at earlier with effect under the new budget. According to the statements made the new scheme is aimed at offering benefit under the scheme for people who are local residents of the state of Haryana. They should have been Citizens of the state by birth. Apart from this the government has also stated that the beneficiaries should be between the age groups of 10 to 70 years to avail the benefit under the scheme. At the same time the beneficiaries should not be registered candidate under the PMSBY (Pradhan Mantri Suraksha Bima Yojana). The benefit can only be availed by the beneficiary under the scheme if he or she has not met any accident at the time of registration process. The new scheme is a type of scheme that will offer beneficiaries with a benefit of Rs 1 lakh. They will also be offered with premiums at free of cost charges. Apart from this beneficiaries will not have to make payments of any other amounts under the scheme. The social justice department has already issued a notification for implementation under the scheme. The new scheme to be launched will be covered under the accidental insurance scheme and will offer full benefit of disability to the beneficiary. The beneficiary under the scheme will be eligible to claim for a benefit of Rs 1 lakh after getting registered under the scheme. The state government has also made it clear that the scheme has been launched with an aim to offer benefit to the local residents of the state only. The government has clearly stated that the beneficiary would be entitled for benefit in case of disability (permanent or partial), death, or accident on account of any issues including rail, air or road accident including terrorism, strike, collapse, lightening, burns, starvation, stampede, or suffocation. The scheme will also offer benefit to women on account of loss at the time of child birth. The state government has launched the new scheme with an aim to offer coverage for people suffering disability (temporary or permanent) or on account of hazardous accident at work place or likewise due to unnatural or natural events. The scheme only does not offer coverage to deaths on account of death due to war or related causes.